My husband heard about this book at a field day, and although he has been farming for 40 years, he wanted to purchase it. insights he gained will increase yields and profitability on our farm. Great reading for anyone who is concerned about the health of their soil and making sure your products have the necessary micronutrients, whether it be livestock or garden products. 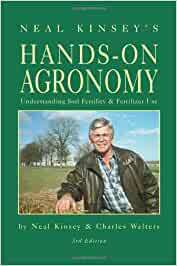 I've read many, many books on soil health and this in one of my favorites right next to my books from Albrecht. Learned a lot. My only suggestion is that you make an audio version for those of us who spend time listening to audible books in the tractor!